Hello there heavyweighter, I'm back to fulfill my balak. Di ko man diretsahang sinabing may part two ang previous enrty ko, eto na, eto na, eto na, waaaaaaaa, doobidoo bidoo, bidooo bidooo. Tedeng! 1. They won't delete, change, or manipulate your account nang di mo pinahihintulutan. 2. They won't reply or answer any messages posing as you, again, nang di mo pinahihintulutan. 3. They won't use your account against you kung sakali mang mag break kayo (wag naman sana, horror yun). 4. They won't harass you or jump to conclusions about anything they find without an explanation from you first. 5. They won't delete, change, or manipulate anything inside your account without permission. 6. They will not abuse their right to your password in any way. 7. Eto pinaka importante, they will appreciate the fact that you gave them access to your account. Pag ito di nila sinunod, abay ano pa ba, revoke na kagad ang right to access. Also, it may only be fair to give your passwords (or share your account in any way) if they have given theirs. Otherwise they may feel as if you have something to hide. 3. Problema Nyo, Ayusin Nyo, and SOLVE THEM RIGHT! 1. Mas lalong maa-upset si labidabs because you are letting people IN on personal matters within the relationship. 2. Maiimpluwensyahan ka ng negative na mga advice kasi nga you're in a bad mood. 3. Jumping to conclusions because you have not talked to your partner first, so pwede mong mamisunderstand ang issue at hand. 4. Giving your friends or family a bad impression of your partner. 5. Appearing weak or unwilling to work things out with your partner, delikado yan. 6. And lastly, mas lalaki lang ang tension between the two of you, at pag ang tension, ayon sa Physics 1 ko, ay di na kinaya ng isang string, boom, mapuputol yun. Para maiwasan yung pagbubuhos ng sama ng loob sa family or sa friends na pwedeng makasira sa image ni labidabs, choose an alternative. One very good way to let out your feelings is to make a journal. This way, you can look back and analyze your feelings further or share it with your partner so they can understand how you feel. Ito yung ginagawa ko eh, and promise mga mam at ser, epektibo sya. Isa pa, tingnan mo rin kung anong magagawa mo sa sarili mo regarding sa issue and whether you can make changes immediately to help. DO NOT always put the blame on your partner. Look at yourself and realize your own faults, BUT DO NOT put the blame entirely on yourself either. Nalito ka ba? Intindihin mo lang, madali lang yan. Napagtanto ko kasi na it's really best that both people take fault for whatever problem that arises, and that you both realize your personal faults and how to avoid it in the future. Huwag nyong hayaang lulutang lutang na parang yellow submarine sa dagat ang isyu mga laberds! Solve them as soon as possible! But DO give yourselves time para mag meditate sa issue. Finally, don't assume anything or take action before TALKING TO YOUR PARTNER ABOUT THE PROBLEM FIRST. Peksman mamatay pa si Spiderman pre, magsisisi ka. Try to show interest and help out in your partner's life. May sikreto ako na sa ilang milli seconds ay di na sikreto. Ako ang number one fan ni Sarah. Heeeee :D Getting involved with their life adds an extra element to the relationship in which you two can work together and learn about each other. This can be done through even small things, tulad nung sa amin, araw araw under the burning sun, under the crying skies pare, sinasamahan ko si Sarah sa lahat ng lakad nya nung nag aasikaso pa lang sya ng papeles nya para makalipad papuntang Saudi. Dahil nga dun e natanong na ng tita nya kung pati ba daw ako e mag aabroad na. Uhaw, init, pagod, gutom, puyat, nakisali ako sa lahat ng yun. So if you just think about it, kung kayo ng jowaers mo yun, wasn't that great? At pagdating ng panahon, nakadapa ka na sa kama, nasa Saudi na sya, nagtatype ka ng entry for your blog, magbabalik tanaw ka, ang sarap ng feeling, na naiisip mong, during those times, she wasn't alone, you were there. O di ba, ang sweeeeet, nyeheeee. Marami sa mga relationships ngayon e yung puro labidabi conversations lang and nothing more. Why not try tinapay? Joke. Strive to make a positive change in each other's lives, wag yung parang device of affection ka lang, ano ka, tau-tauhan ng isang pre schooler? Making an effort to better your partner and yourself creates a stronger bond between both of you and will help in the long run. You can make changes to their lives in many ways. Example ulet tayo, sa akin ulet, wag ka nang umepal, buhay ko yung alam ko e. Dati kasi, walang pakundangan ako sa pag inom. Yung bisyo ko, madali lang, ABCD lang. Alak, Babae, Cigarettes, Droga. Dun sa babae, di masyado, di naman ako kagandahang lalake e. Patapon ako nun, parang wala nang bukas kung maka inom. Parang mauupos ang pipe kung maka hit. Pero lahat yun nabago nung dumating si Sarah sa buhay ko. Natatak sa isipan ko, "Mabubuhay ako ng matagal para sa'yo. ", naks naman. Ano kasi yan e, if you're going to make your lives better, it'll be good for the both of you din. When both of your lives are good and happy, your relationship will be as well. Finally, prompt your partner to help change your life by simply asking for their support. Hindi porke mag jowaers na kayo e pwede nyo nang paliparin palabas ng bintana ang friendship nyo! Don't just be lovers, be friends with each other. Don't rid yourselves of friendly ways or hobbies. Always keep a strong friendship within the relationship. Sa amin nga, ang dami nang nakapagsabi ng, "Ay, magsyota kayo? Akala ko magbarkada lang. Sa galaw nyo kasi parang magbarkada lang kayo e.". Kasi nga raw, madaming baklang prenship tong si labidabs ko, kaya sa kaseksihan ng katawan ko, napapagkamalan na rin akong kumare. Haynaku. Bwahaaaaa. Nalito ba kayo? Long distance nga pinag uusapan e nasabi pang be there. Anyway hiway, you can't physically be there for them of course, but you can still offer comfort. Kung may nangyaring di kanais nais icomfort mo kagad, and express your feelings and desire to help them. Remember that if your partner is upset over a serious event, do not expect them to recover immediately. You should let your partner know that you don't expect them to cheer up immediately and that you'll be there for them the best you can. Importante rin na huwag mong iwang hanging si labidabs if you have to be absent during this period. If they are seriously upset, give them advice on how to make themselves feel better or who to turn to for help (Example: Kain ka na lang ng marami or tulog marami then talk to your best bud later). It would also be a good idea to provide them information to reach you (Eto yung sa part 1) and to let them know that it's okay for them to contact you if they need to. To further make sure that your partner will be alright, ask someone else to check on them and speak with them. You could ask one of their friends or family, or one of your own. Being in a long-distance relationship is hard enough, at mas lalo pa tong pinapahirap ng mga walang magawang ewan bakit pa ginawang mga epal. Just ignore comments such as: "Long-distance relationships don't work." or "They're probably cheating on you." or "Why don't you just get a guy/chic around here?". These people are either misunderstanding, arrogant, or simply have different views (Okay lang yan, normal!). Yea, sobrang hirap ng nasa LDR, but just remember that you may be getting more from your long-distance relationship than other peoples' short-distance relationships. It's about WHO you love and not how CLOSE they are. 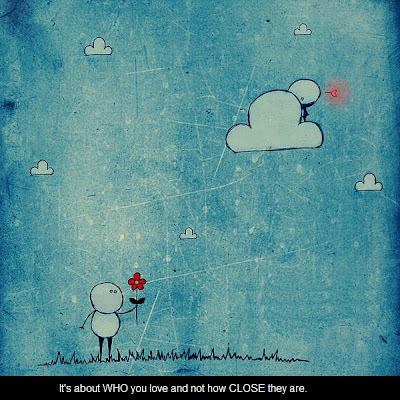 Love knows no distance! Hooray! Ito rin yun e, yung reason bakit may bigla biglang sumusulpot na went from being "in a relationship" to "single" tapos balik ulet sa went from being "single" to "in a relationship" na status sa Facebook. Normal lang na there'll be times when your partner is upset, whether they're angry, sad, or anything else. Sa mga ganitong times, a good advice to take would be to reach out and then back off. Attempt to comfort them, and if they accept then you may proceed in doing so BUT also give them space. If they do not accept your attempts to comfort them, then try to give them some space then make an attempt na lang ulet later. May mga tao kasing mas gustong mapag isa pag nagtatransform into a bad wolf, joke, yung pag nasa bad mood, and you should respect that wish. Pero kahit ganun, every now and then, still try to show some affection and support para maramdaman nila na you care for their feelings din. Don't take it to heart if your partner snaps at you during a period of stress. They may later realize what they did and apologize for it. Many people say things they don't mean when they are upset. Isa na jan yung labidabs ko, heeee. Pag si Sarah kasi nagalit, nakuuuuu. Pero she advised me not to listen to her naman when she's in such a mood, lalo na yung mga nasasabi nyang out of this world, haaaaa. To understand your partner when they are upset, discuss with them (when they are in a neutral mood) how they feel during that time and anything you can do to avoid provoking it further. Have them explain why they behave the way they do and whether or not you should take to heart anything they do or say. If your labidabs snaps at you, huwag kagad gumanti. Remain calm, or else you risk making the situation worse. Trust me, I've been there. You could even tell them that you want to give them space, or you could try to calm them down. But remember: It is natural and okay for someone to have a minor snap when they are in a bad mood. It is NOT okay when they have a major break down to the point that they do/say anything that severely hurts you emotionally. It is NOT okay for your partner to harass or abuse you, no matter how upset they are. If your partner has issues controlling anger, then seek help for them, orayt? All too often, people go about in their relationships ignoring the key elements that truly matter. Di pwedeng puro ka lang i love you, appreciate your partner. Give them thanks for everything that they've done, and from there get more specific. Thank them for small and large things. Make sure that you express your appreciation often and vividly. Sa ganitong way, mas mararamdaman yung pagmamahal at, pagbibigay mo ng importance sa labidabs mo. They will also see that you're actually thankful for the things they do for you and will strive to do more in the future. Since you are in a long-distance relationship, you need to work extra hard to make sure your partner knows that you enjoy being with them and that you are thankful for everything they do, kahit na di kayo magkasama. 1. Una dito is yung sila lang nasusunod at sila lang ang lging tama. 2. They make all the decisions in the relationship, and ignore your suggestions. 4. They make you feel weak, lesser, bobo, minuscule. 5. They don't ask for how you feel on a subject involving your relationship. 6. They don't consider your feelings during an argument. 7. It's all about what they say, think, feel, not about you. Kung may napapansin kang ganito sa relationship nyo, ay naku, may under nga. But if you don't notice these signs on your labidabs, ireview mo sarili mo. Are YOU running the relationship? Look through the list above and decide, or just ask your partner. Kung sakaling feeliing mo lang na parang ina-under mo na ang partner mo, talk to them about it every now and then. Ask them if they feel that you are running the relationship and assure them that you want them to be honest so you can work to fix it. If you feel like your partner is running the relationship, speak with them about it, wag kang matako, wag kang mahiya. Tell them how it makes you feel and how it is hurting the relationship. If they refuse to change or accept what they're doing, it is a serious problem and should be dealt with. Continue to discuss the matter and try to compromise, if they keep ignoring all your attempts then it may be best to give them an ultimatum. Lagi po nating tatandaan, a relationship is consist of two people, and should be run as so. Make decisions together. Take each other's feelings into consideration and do your best to make both people happy. Talagang mahirap ang long distance relationship. Pero kung maniniwala ka lang, naman men, walang impossible. Loving isn't all about the hearts, dapat din may brain. If you're going to have a relationship, be sure that you can handle it. Sa mga nagsasabing laro laro laang yan, tanginangyan, mamatay na kayo. Di biro ang pagmamahalan, dahil kung wala yan, di rin kayo nakalabas sa bayag ng tatay nyo. What I'm saying is, we have to take a relationship seriously, cause it involves other people's feelings too. If you can't respect them, then, whose going to respect you? Huwag yung collect and collect then select, naknang tupa, nanay mo kaya ginanun, ayos ba sa'yo? Kung laro lang gusto nyo, kitakits na lang sa Flyff, dahil magmemerge na ang tatlong server this January 11, dun ko kayo mapi-PK ng malupet, bow. Posted in English, Love, Tagalog . Bookmark the permalink. RSS feed for this post. i like your blog,most of it nakarelate ako and it is happenings on us.we are in 3 years of LDR,at sobrang hirap lalo na kung may malaman kang infedelity.natawa nga ako sa password issues kasi dun ko nabuking na may kalokohang ginawa ang partner ko.pero i am still here nagmamahal kahit nasaktan na and we are still going and going kahit alam kong maraming mas higit sa kanya na mas malapit sa akin.pero like what you said "it is about WHO you love and not how CLOSE they are. "hirap lang magpakatatag at magpakasanto sa LDR.thanks for the nice blog! Tungkol naman sa LDR, ayos lang yan. Pag nagmamahal ka, nasasaktan ka talaga. Love always hurts. I really don't believe in sharing passwords. LOL. I have trust issues kasi. But we do have a gaming system. In fact, we're both fond of online gaming (that's how we met). Dati long distance kami. But now we're living together na. And three years na din kami. So yeah, if you're both willing, LDR works. great post paliiits. nakakaenjoy basahin blog mo. Congrats paliiits! please email me your contact details at admin (at) pinayads (dot) com so that we can communicate on how to claim your prize.